The Optimist Club of Calgary has been presenting the “Optimist Festive Showcase” annually for a number of years. The Showcase has become an anticipated event, leading up to Christmas. The Showcase provides an opportunity for a number of local groups to perform for their families and the public in a premier facility. The Optimist club of Calgary has supported some of the groups in the past. These groups are now helping the Optimist Club of Calgary raise funds by performing in the Showcase. Congratulations to the Penhold and District Optimist Club for your project making it to the semi-finals of the competition. Voting started on December 2nd, and they need all of our help for them to make it to the finals. We encourage all Optimists in the District to take the time to vote daily for this project! AMSNW Governor (Tim Bell) Welcome Address at Prince's Island Park in Calgary on the second day of his year as District Governor. Marilyn is the last remaining charter member of the Calgary Dinner Optimist Club, formed in 1994. She has served as Club President several times (attaining the levels of Honor and Distinguished) and as Club Secretary. Marilyn is a past Lieutenant Governor for Zone 6 in 2001-02 (Honor) and 2008-09. She is a BOE helping to build the Traditional Optimist Club of Calgary. Marilyn served as the first District Juvenile Curling Chair and was instrumental in getting Optimist Juvenile Curling started in Alberta. Marilyn served as the Essay Contest Chair last year and this year has volunteered to serve as the District Secretary-Treasurer and Activities & CPA Chair. "I became an Optimist to help serve the youth in my area. I ontinue to be part of this organization because of the difference my club is making in the Calgary area by helping youth at all levels. What is I enjoy most about this organization is the people that I have met helping youth in the District and beyond." As part of the District Services Team, my role is to promote the participation by member Clubs in all of the youth program and community-serving projects sponsored by Optimist International. I'm also responsible to organize the judging of the Club CPA and Scrapbooks at the 1st Quarter District Conference in 2011. George joined in 1986 and has served as Honor Club President (1994-95) and Club President (2009-10). He has also served as Bingo Chair, OptiMart Chair, Newsletter and Website Chair; and he served as Zone 7 Lieutenant Governor in 1996-97. Why did you become an Optimist? "Dad was a member before me, and loved working with the Optimists." As a serving webmaster for his club, George runs a website and a facebook page. At the 3rd Quarter District Conference on May 15, 2010, George presented an informative workshop about using 'Vertical Response' as a mass email tool to regularly send out club bulletins to club members. George brings a wealth of experience to the position of District Bulletin Editor. What is the primary reason you continue to serve as an Optimist? "I enjoy helping kids, and the fellowship is fantastic." Understanding and utilizing print and online media can greatly extend the reach to the general public that a club needs to ensure a successful project or fund raiser. Club bulletins provide that 'personal touch' and are an excellent tool for members to recruit new members. Besides publishing a regular District Bulletin, George is willing to help any club with publishing a club newsletter and produce press releases. Ray joined in 1982 and has served as Club President (Prince Albert High Noon). Ray is a Builder of Excellence helping to build the Border City Lloydminster club. Ray has served as Zone 7 Lieutenant Governor (2002-03) and District Secretary-Treasurer (1988-89). Ray is busy planning the Annual District Convention scheduled in Prince Albert for 11-13 August 2011, and he is looking forward to welcoming everyone to Prince Albert next summer. Why did you become an Optimist? "To meet new people in Town and have a good time." District meetings are not just about business ... they offer excellent training workshops and opportunities for members to network with fellow members at a wide variety of fellowship activities. Organized as 'bring the family' events, each District meeting offers a 'Companions Programs' for non-member spouses and a 'Kids Program' for the youngsters. What do you enjoy most about being an Optimist? "The variety of different people and the variety of different projects that serve the kids." District involvement and became Lt. Governor in 1992-93. In 2005, he joined the Downtowner’s Optimist Club of Regina and was President in 2008-09. Lyle served as our District Governor in 2002-03, and has served as District Secretary-Treasurer for Gary Cross in 1996-97, Membership Chair, International Ambassador, Candidate Qualifications Chair and is serving his second consecutive term as the District Foundation Rep. Lyle looks forward to promoting your participating in OI Foundation fund raising. "I thoroughly enjoy being an Optimist member and Deb and I have attended every convention since 1988 except one due to illness. The friends we have made in every area of the District, as well as at International functions, are amazing." Many of the OI programs offered by clubs are financially sponsored by the Optimist International Foundation (OIF) and the Canadian Children Optimist Foundation (CCOF). The role of the DFR is to coordinate fund raising efforts for the foundations and on behalf of the foundations recognize those Optimist members who have made significant contributions over the past year. Lyle invites members to participate in the Foundation Workshops at the quarterly District Conferences. Brian joined in 1981 and has server as a Distinguished Club President (St. Albert 1991-92) and Honor President (Edmonton Dinner 1996-97). and Zone Lieutenant Governor in 1998-99. Brian has served two terms as District Supplies Chair (2005-09 and 2009-10) and is returning to co-chair Supplies with Loran Salsbury. Brian invites you to purchase Optimist Supplies that will be available at all the District meetings this year. Why did you become an Optimist? "We needed 25 members to Charter St. Albert and my Dad Keivin was an Optimist." As part of the District Services Team, our role is to promote the sale of Optimist supplies to members and clubs. We work closely with the staff from the Corall Group, the official supplier of Optimist supplies to operate a supplies table at each of the quarterly District meetings. What is the primary reason you continue to serve as an Optimist? "Fellowship and find Optimists are a valubable resourse in serving youth. I am involved with Scouting and would not be able to do as much without the Optimist Club." Lorne assisted Brian with running the Optimist Supplies tables during 2009-10 and looks forward to leading the Optimist Supplies at the District meetings in the US this year. 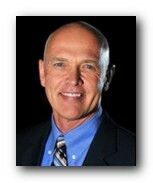 Gordon has been an Optimist since 1996 and has served as a Club President (Honor) and Club Secretary. Gord is returning this year as Web Services Chair to complete the work he started last year. He hopes to extend web services to better support Zones and Clubs, and invites fellow members to attend his workshops at the District quarterly meetings throughout the coming year. Why did you become an Optimist? "I was new in St. Albert so I joined to meet people and have fun. " 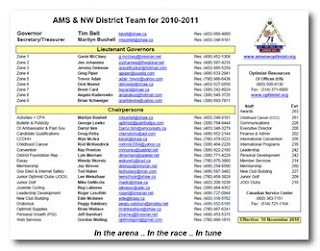 The mission of District Web Services is to provide a dynamic, accurate and complete online presence for AMS&NW District 13, and to extend web services to Zones and Clubs. I invite you to participate to the Web Services workshops that will be held at the quarterly District Conferences. What is the primary reason you continue to serve as an Optimist? "I believe that our kids are our future and we can shape our future by influencing how we raise and educate our kids. " If you’re still thinking about attending, the pre-registration dates have been extended. The Great Plains PDC now has over 200 Optimists registered, and the recent extension of the early-bird conference costs might be the incentive for you to join me in Bloomington. Great News for the Great Plains PDC! I’ve just received notice from Nancy Solinger, our Holiday Inn liaison – because of the tremendous volume of reservations received in the last week she is extending our room block through midnight (Central time) Friday the 22nd of October. Because of this, we are also extending to the same date/time the Early Bird rates for both Members and Shoptimists. Please let your district chairs and district teams know about this great development; Steph is sending out a message to club presidents and Lt Govs from OI tomorrow, I’ll send to club Sec/Treasurers. Great news – it’s been a wonderfully busy day registration-wise. Drum roll please…….we have passed the 200 mark! Glen is updating the spreadsheet as we speak; I’ll get that to you as soon as I receive it! WOO HOO! Have you ever eaten oatmeal and ice cream? Good morning AMS&NW Club Leaders! It doesn’t seem possible that a week has already passed since I joined Governor Tim and so many other wonderful AMS&NW members at your first quarterly meeting in Great Falls - thank you so much for your hospitality! But even more so, thank you each for accepting your current position – whether this is your first time as a club officer, or you are seasoned in your position – Governor Tim and the members of your clubs wouldn’t be able to do “their jobs” if you hadn’t accepted yours! International President Danny Rodgers has recorded a special video message for all of us in the Great Plains Region. Please scroll to the bottom of this message; I’ve highlighted Danny’s in yellow. Thank you again for your service. If I didn’t get the chance to meet you in Great Falls, I look forward to doing so either in Bloomington, or at some other optimistic opportunity throughout the year! And if there’s ever anything I can assist with throughout the coming year, I hope you’ll let me know how I can help. 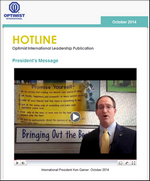 Click the title for a video from OI President Danny Rodgers. Rod is returning to the District Team as the CCC Chair. In addition to serving a Club President and Zone Lieutenant Governor, he served as District Governor in 2005-06. Rod has served as Membership, International Ambassador and Candidate Qualifications Chairs in previous years. Rod has a strong passion for Childhood Cancer Campaign looks forward to engaging club leadership to become familiar with the communities’ programs already in existence for childhood cancer, and seek out ways to enhance those programs through Club involvement. My primary role is to promote the Club/Zone participation in a childhood cancer program. I urge Club leadership to seek out opportunities to serve children with cancer and their families. We have a lot of valuable resources available to you to help with your active participation in the Optimist International Childhood Cancer Campaign. Wyn is returning to the District Team for a second consecutive year as the CCDHH Contest Chair. She has been very active with running the club and Zone Oratorical and CCDHH competitions in the Edmonton area for many years. Wyn is passionate about the power of public speaking and how it helps to give youth the courage to overcome personal obstacles. invites you to become active with engaging local Schools for the Deaf to run local CCDHH contests so that a sizeable field of competitors can participate in the District competition. It is important for club leadership to conduct a local CCDHH contest, or otherwise sponsor a youth from one of the schools supporting deaf and hard of hearing students into a District Contest if the number of participants are limited at the local level. My primary role is to promote Club participation in the Communications Contest for the Deaf and Hard of Hearing and to conduct a District Competition. I invite you to become active with engaging local Schools for the Deaf to run local CCDHH contests so that a sizeable field of competitors can participate in the District competition. We have a lot of valuable resources available to you to help with your active participation in the Optimist International Club and District CCDHH Competition. Oratorical / CCDHH Contest Chair. Wendy has been married to David since 1991. Her and David have a blended household that consists of 5 children and 3 grandchildren. Wendy volunteers on a variety of activities that the younger children participate in. She has been a Administrative Secretary for 25 years. My primary role is to promote Club participation in the Essay Writing Contest and to conduct a District Competition. I invite you to become active with engaging local Schools for the Essay contests so that a sizeable field of competitors can participate in the District competition. We have a lot of valuable resources available to you to help with your active participation in the Optimist International Club and District Essay Competition. Peggy is returning to the District Team after serving as Zone Lieutenant Governor last year. Peggy is looking forward to hosting a very active Oratorical contest at the 3rd Quarter District Conference in Billings in May 2011. Please contact Peggy for information on how to setup and run local Oratorical contests to locate competitive young speakers for the District contest. My primary role is to plan, promote and conduct the annual District Oratorical Contest Finals at the Third Quarter Conference. I invite you to become active with engaging local Schools for the Oratorical contests so that a sizeable field of competitors can participate in the District competition. Mike is returning for a second year as the District Junior Golf Chair and plans on an even more successful District competition in early August, 2011. Mike is a long serving member of the Calgary Optimist Club since 2000 and was recently awarded a 'Life Membership' from his club. Mike has served as an Honor President (2001-02 and 2002-03) and he helped build the Calgary Traditional Optimist Club in 2005. Mike is passionate about Junior Golf and is active with promoting Juvenile Curling throughout Alberta. What is the primary reason you continue to serve as an Optimist? "I continue serving as an Optimist because there are several Optimist projects that I feel very strongly about and I want to help them succeed." Mike served as a Distinguished LG for Zone 6 in 2005-2006. He served as District Essay Chair and District Oratorical Chair 2007-2008. What do you enjoy most about being an Optimist? "I really enjoy the positive feedback I get from the community when I'm assisting on a project." My primary role is to plan, promote and conduct the District Junior Golf Tournament, and to increase participation in local and International OIJGC. "As Chair of the Junior Golf Program this year, I want to increase the number of local qualifying Junior Golf tournaments in the District and increase the number of participants" . Mike invites you to attend the Junior Golf workshops at a Quarterly District Conference nearest to you. Reg is returning for a second year as the District Juvenile Curling Chair and plans on an supporting the Under-18 OI Juvenile Curling Competition this year. Please contact Reg for information on how to support Juvenile Curling in your local community and the Province or State Competitions. The Optimist International Juvenile Curling Competition started as a partnership between Alberta Optimists clubs and the Alberta Curling Association to form a curling competition for under-18 youth curlers. The first competition was held in Calgary in 2001, and it has grown into an international competition that features boys and girls teams from Canada, the United States and Japan. The Optimist International Youth Programs Committee officially sanctioned Juvenile Curling as an Optimist International Program in late 2009. My primary role is to promote the Juvenile Curling Competitions and encourage Optimist Clubs throughout the District to participate and assist with local U18 youth curling competitions. Ted is a long serving Optimist with the Bozeman Breakfast Optimist Club. Ted has served as Club President and Zone Lieutenant Governor in 2008-09. He is returning to the District Executive to serve as District Governor-Elect and Internet Safety Program Chair. Ted invites you to explore and deliver internet safety training programs in your local community. Internet Safety is a relatively new initiative from Optimist International who partnered with ikeepsafe.org to develop an Internet Safety education program which includes training for youth, adults and adult educators. Suitable for introduction in local schools and youth organizations like Boys and Girls Clubs, Boy Scouts, Girl Guides, and youth sports teams. We have a lot of valuable resources available to you to help with your club's active participation in the Optimist International Internet Safety Program. Ted invites you to attend the Internet Safety Program workshop at a Quarterly District Conference nearest to you. Just click on the link above, to view the new newsletter. Your`s will be personally addresses to you. If you didn`t receive a copy, please email me, optimistgeorge@paintballpa.com, and I`ll have you added to the list. Please send me your email, first and last names and which club you belong to. Beginning this Optimist year, the Oratorical Contest age limit has been raised to under the age of 19 as of December 31 of the current school year. This change provides many new opportunities for Clubs to find contestants! Try approaching a debate team or drama club at the local high school to find new participants. Invite the Members of a local JOOI Club to enter. Hang posters promoting the contest with your Club Chair’s contact information in the library or local community center. Ask the local high school if they will run a promotional piece about the contest in the school newspaper. Clubs are still encouraged to invite junior high and middle school students to participate. Competing in the contest provides them with valuable public speaking experience and gives them a chance to showcase their skills. Students may enter the contest every year until they win a District-level scholarship, as long as they meet the age requirement. The decision to raise the age eligibility requirement for the Oratorical Contest was made by the 2009-2010 International Activities Committee. This decision was made after a lengthy discussion and thoughtful consideration. The committee saw merit in making the requirements consistent for both the Optimist Oratorical and Essay scholarship contests. It was recognized that students in their junior and senior year of high school are the most focused on obtaining scholarships since they will be attending college in the near future. The committee felt it would benefit and serve more youth if the age limit was raised and create a larger contestant pool for Clubs and Districts. Committee Members also felt that public speaking is an important skill for older students to have that will be utilized greatly during their college years and even in the workplace. The rationale for allowing the younger students to compete with the older students has not changed. Since there has been no minimum age for a number of years, many Clubs have had students in the 5th and 6th grades competing against high school sophomores. Allowing the younger students to participate gives them the opportunity to practice their public speaking skills. There have been a number of cases where Districts have had students at age 10-12 scoring higher in the contest than students at 15-16. If the young students do not win a District scholarship, they are welcome to continue to enter the contest each year until they do. They have the opportunity to learn from the older students while gaining valuable experience and fine-tuning their skills. While some students may be deterred from competing against older students, there is also a number who will be accepting and ready to take on the challenge. The students who shy away from the contest this year may see how well their peers did and decide to compete next year. The intent is not to deter these younger students from participating but to open this opportunity to more students. Roger is a long serving Optimist since 1984 who is strongly committed to leadership development as part of building a strong District. 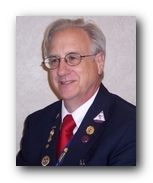 In addition to serving a the District Governor in 2003-04, Roger has served as Leadership Development, Membership, Retention and New Club Building Chairs in previous years. Roger served as Club President (Distinguished) in 1997-98 and as Zone 1 Lieutenant Governor for 1998-2000. Why did I become an Optimist? "Initially to get on a softball team the optimist club had." Roger just completed a year on the OI Convention Committee that planned and ran the Annual Convention in Denver. Roger enjoys helping the kids and all the great friends he has made because of Optimism. What is the primary reason I continue to serve as an Optimist? "I believe in all the aspects of Optimism and the great things we stand for." As part of the Growth Team, his role is to plan, promote and conduct the training of Club and District leaders making them more effective leaders. Roger believes in all the aspects of Optimism and the great things we stand for and he invites everyone to attend the quarterly District Conferences to participate in the many informative workshops. What do I enjoy most about being an Optimist? "Not only helping the kids, but all the great friends I have made because of Optimism, throughout this District and in my own club." Jay joined the Billings Breakfast Club in 2002 and he is strongly committed to increasing membership in each club throughout the District. He has served as Distinguished Club President (2005-06) and Distinguished and Outstanding Zone 4 Lieutenant Governor (2006-07). Why did you become an Optimist? I became an Optimist because I was asked. I had belonged to a service club (Kiwanis) since 1982. When a job change forced me to resign in 2001 because I could not attend the 2 hour luncheon meetings, I felt something missing from my life. I enjoyed giving back to my community and I enjoyed associating with people of true character. When my best friend in the whole wide world, Greg Piper, asked me to become a Breakfast Optimist, I jumped at the opportunity. Jay last served as the District Junior Golf Chair for 2007-2009 running two very successful District Junior Golf Competitions. Jay enjoys being an Optimist and invites everyone to spread the gift of membership to a friend. What do you hope to accomplish in your District position this year? I want to teach my fellow Optimists how to great ambassadors for Optimism. When their enthusiasm and character shine through they cannot help but succeed when they ask a friend to become an Optimist. Membership is the lifeblood of any Optimist club. Clubs that run one community service project a month, one fund raiser per quarter, ensure that all members are assigned to a club committee, enjoy a strong and active membership. Running a successful new member recruitment drive is vital to the future success of your club. I invite you to attend the quarterly District Conference workshops on membership. What is the primary reason you continue to serve as an Optimist? That’s easy. I’m selfish. I get more out of being an Optimist than I put into it. In return for a few hours of my time I get to associate with the finest people in the world. I get the satisfaction of seeing kids realize opportunities that they would never have had if it had not been for our organization. Who wouldn’t want to do this? Edie is a Charter President (Distinguished) in Blackfalds in 2002-03 and Zone 3 Lieutenant-Governor in 2003-04. Edie previously served on the Growth Teams for Past Governor Don Morrison (as New Club Building Chair), Norm Sagen (as Membership Chair) and Doug Kirby (as Membership Chair) where she was successful in helping the District achieve Distinguished growth goals. How did I become an Optimist? "I saw an ad in our local utility bill that asked 'Would you like to help the kids in your community?'. I went to the information meeting hosted by the Red Deer Optimist Club and I liked what I heard. We are a small community and we did not have a lot for the kids in our town to do. Since the Optimist Club's organization there is a ton of stuff for our kids as well as a JOOI Club and an Octagon Club. I love the friendships I have made! My closest friends are Optimist members!" Building a new Optimist club in a community without a club is one of the most satisfying projects that you can participate in, and is one of the greatest gifts that you can give to a local community. I really believe that every community needs an Optimist Club! I would like to help start a new club in all the small communities, like my own, because it has helped our little town so much. I invite you to attend our New Club Building workshops at the quarterly District Conferences this year. Lee has server as an Optimist in St. Albert since the early 90's. She has served as a Distinguished Club President and Secretary-Treasurer. In addition to serving as Distinguished & Outstanding Governor in 2000-01, Lee has served on previous District teams as Club Services, Faculty, Essay and Candidate Qualifications Chairs. Lee is looking forward to meeting fellow Optimists who want to build new JOOI clubs throughout the District. JOOI clubs are often more active delivering projects in their community. Building a JOOI club goes a long way to helping to train the leaders of tomorrow. I invite you to attend the JOOI club building workshops at the quarterly District Conferences this year. Jeff joined the Great Falls Uptown Club in 2001 and has served as Honor Club President in 2003-04 and as Distinguished Lt. Governor in 2006-07. Jeff has been bestowed a life time membership by his club for his work as an Optimist.
" Throughout my military career I believed that only with the help of many can we make a difference. I was introduced to the Club and found that here were many who wished to help a very needy and deserving population of our community. I appreciated the intense meaning of the creed which supports our organization's goals and philosophy and I appreciated the opportunity to give back to my community. " As the PGI Chair Jeff plans to encourage all the incoming Lt. Governors and incoming Presidents to get every member who already has achieved one level of PGI to aspire to move up at least one more level. In addition he hopes that all the new members recruited this year will be enrolled into PGI and as a minimum will complete their first level as quickly as possible.
" Each year that I have enjoyed working with the club, makes me less cynical about where our younger generation will lead us. I enjoy seeing the effort that we do materialize into some greater good that one person alone could not accomplish. Some of our working members I know have their own problems and concerns, but regardless, will take some time off without first thinking of themselves and whats in it for them. It is a pleasure to work with a strong team who see the rewards of their labor without first thinking of themselves. " Running an active PGI program at the club level helps to strengthen an active membership by enabling them to take ownership of their participation. We will continue to run PGI training modules at the quarterly District Conferences. This is an excellent opportunity to train your next club PGI Chair.
" I have found that the best part of being an Optimist is what it has forced me to become ... I realized that the sincerity of those that are in the organization with me is habit forming, and not only brings out the best in kids, it also brings out the best in the adults. I believe I have been better prepared to perform my duties at work and at home with a better feeling of satisfaction and a far better appreciation for our fellow man. " TO PROVIDE YOU WITH A WIDE VARIETY OF FIRST-CLASS BREAKOUTS, ROUND TABLES AND TRAINING SESSIONS. PGI, or Personal Growth and Involvement is a learning program for Optimist members that encourages their growth and participation in Optimism as they gain experience. Optimist International has made some changes to the PGI requirements at various levels, and has released revised versions of the PGI Program and the PGI Passport Requirements. PGI Passport fold-out cards have been revised and are being mailed to our PGI Chair, Jeff Barnhart. If you would like to receive a replacement set, please send Jeff an email indicating how many passport cards you will need. Members with existing PGI levels completed will be able to transfer those the new PGI Passport Members will also be able to transfer completed steps for those PGI levels not yet completed. Our goal for the 2010-11 year is to officially register as many Optimist members as possible; to ensure that all new members are tenrolled into PGI; and to encourage all registered members to progress one PGI level this year. Please refer to Personal Growth & Involvement page for additional details. To register your club members, please contact Jeff for instructions. We look forward to contributing to the personal growth of our members as part of improving the strength of our District. Tim is a long serving member with the Airdrie Optimist Club. He has served as Club President and Secretary-Treasurer several times, and is a past Lieutenant Governor for Zone 6. Tim has a passion for fund raising for Cancer related projects in Calgary region. He served as the District PGI Chair for 2007-09 before serving as Governor-Elect and Membership Chiar last year. My primary role as the District Governor is to encourage and engage our members to grow our District by recruiting more members, building new clubs in smaller communities that need an Optimist club, running more community service projects for youth and sponsoring Optimist youth scholarship programs like Oratorical, Essay and CCDHH competitions, and the Junior Golf and Juvenile Curling competitions. Marilyn is the last remaining charter member of the Calgary Dinner Optimist Club, formed in 1994. She has served as Club President several times (attaining the levels of Honor and Distinguished) and as Club Secretary. Marilyn is a past Lieutenant Governor for Zone 6 in 2001-02 (Honor) and 2008-09. She is a BOE helping to build the Traditional Optimist of Calgary. "I became an Optimist to help serve the youth in my area. I continue to be part of this organization because of the difference my club is making in the Calgary area by helping youth at all levels. 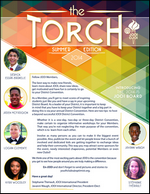 What is I enjoy most about this organization is the people that I have met helping youth in the District and beyond." My primary role as the District Secretary-Treasurer is to provide administrative and financial management support to Governor Tim and the rest of the District Team and Lieutenant Governors throughout the Optimist year. I encourage all clubs to file their reports in a timely manner and ensure that OI and District dues are paid in a timely manner. Ted is a long serving Optimist with the Bozeman Breakfast Optimist Club. Ted has served as Club President and Zone Lieutenant Governor in 2008-09. He is returning to the District Executive to serve as District Governor-Elect and Internet Safety Program Chair. Deeply committed to ensuring that OI grows in strength and commitment to supporting youth, Governor-Elect Ted invites everyone to renew your individual Optimist passion to 'Bring out the best in kids'. My primary role of the Governor-Elect is to act as the eyes and ears of the District so that I can prepare for a successful year. One of my key goals is to build a dynamic team that can continue the work of Past Governor Darryl and Governor Tim as we meet the challenges of serving the needs of our communities. Immediate Past Governor Darryl returns this year to promote member attendance to the Annual OI Convention, scheduled for July 2011. Darryl joined the Optimist Club of Red Deer in 1999 and has served as Club President (Distinguished) in 2004-05. He was a Distinguished President for having increased club membership by Net+ twenty-five and starting a new club. For that year he was honored to receive the District Alex M. Wilson Award and the Over and Above Award . Darryl served as a Lieutenant Governor in 2007-08, receiving a Distinguished Lieutenant-Governor Citation from the District and from International Past President Theo Golding he received the Presidential Above and Beyond Award as one of the top ten Lieutenant-Governors in all Optimist International. Darryl served as the New Club Building Chair and Governor-Elect in 2008-09 prior to serving as Governor in 2009-10. The 2010-11 Optimist International Convention will be held in Baltimore, Maryland, for early July, 2011. Past Governor Darryl invites anyone who can attend to register for the convention and take advantage of the excellent training workshops that are provided. Refer to our meetings page for more details as they become available. 2008-09 Past Governor Doug is hunting and searching for our next Governor-Elect and invites qualified candidates to submit the nomination papers as soon as possible. Doug is a long serving member with the Billings Breakfst Optimist Club and has served as Club President and Zone 4 Lieutenant Governor. Doug has served as Membership and New Club Building Chairs before his year as Governor. Continuing to build strong and dynamic District Teams each year relies on finding suitable candidates for the position of District Governor. As your Candidate Qualifications Chair, my role is to present a slate of candidates for the position of Governor Elect for 2011-12, to serve as Governor in 2012-13.